The pump is driven directly by the sunlight. So it will only work if the sunlight is enough. Since the performance of the solar panel depends on the sunlight, the pump is also affected by the weather, seasons, places, etc, to peel the plastic film protection on the surface will make it better. Since emptying pumps (without water) can damage the device, you should always place it in the shade (eg cabinet) when not in use. The fountain only works in sunshine, of course, and even in moderate sunshine it starts to bubble. The strength, however, depends on the sun. As this pump is driven by direct sunlight, as such, the height of the fountain depends on the intensity of the sunlight. 【 Various Sprayers 】The fountain has 6 different nozzles so you can combine them as you like, with different sprayers it will spray differently. 【 Eco-Friendly 】No battery or electricity needed. 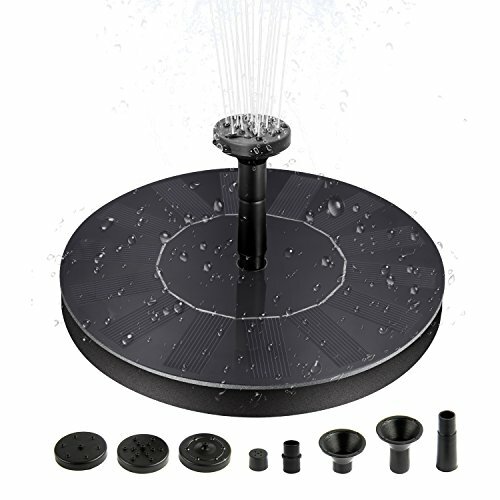 The fountain will run automatically in seconds when sunlight is sufficient. 【 Easy to use 】Easily install, move and clean, can float on water without pump, no plugs required. The water pump is located on the lower solar panel. On the back there are small suction cups so the pump has firmly stuck to the ground. If you have any questions about this product by BHY, contact us by completing and submitting the form below. If you are looking for a specif part number, please include it with your message. Fishing Girl Cast Stone Statue-sculpture/pond and garden decor/accent- Great Garden Gift Idea!